Half of the Greek economy is based on service sector and tourism industry employment, and many Europeans visit Greece during the summer when the most festivities and services are available. But Greece is a year-round vacation destination that lacks frigid winters, with yearly temperatures ranging from 50 to more than 100 degrees Fahrenheit. Off-season travelers have plenty of opportunities to experience well-rounded Greek vacations with less traffic, nice weather and fun cultural events. The best times to visit Greece are spring and fall, says National Geographic Traveler magazine, because you'll find the best weather, blooming wildflowers and hotel availability. Fodor's adds that the sun is bright and the air invigorating during months like September, October, May and June. By contrast, summers are scorching hot, with low humidity and July temperatures exceeding 100 degrees. Winters are mild, with average temperatures ranging from 55 to 60 degrees. But expect cold, wet, bleak days from November through February, says Lonely Planet. Rain is common during the winter, but snow is rare, so most locals wear light coats. 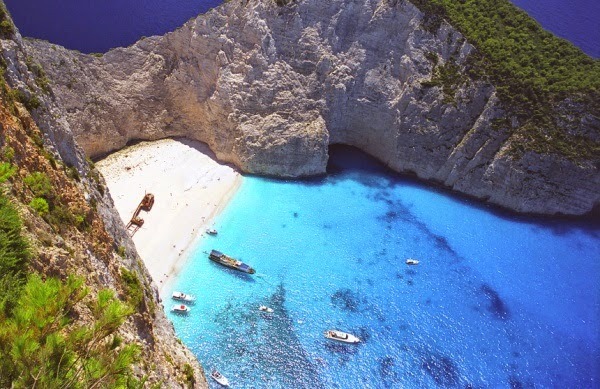 Half of Europe is vacationing in Greece from July through August, warns National Geographic Adventure. The crowds are seduced by sunny beach days, warm surf, bustling nightlife and events. Sherman's Travel adds that hotel prices are high, resorts feel overcrowded and reservations are mandatory wherever you go. Instead, visit late April to mid-June or September to mid-October to avoid tangoing with hordes of other tourists. The nightclubs may not be as packed with an attractive international audience, but you'll find the 70-degree air comfortable, the water warm enough for swimming and all the local attractions open. Ferry service and flights are cut back by late October, explains Frommer's, and many hotels, restaurants, buses and attractions begin closing down for the winter. Skiers enjoy the Greek mountains from November through March, a time frame that offers great deals on hotel stays. Crete is fully open to guests year-round, says Smarter Travel. Avoid major holidays when everything is closed -- particularly several days around Easter and Aug.15th, "The Day of the Panagia." Cultural events are a big reason so many Europeans are willing to deal with the crowds and the heat during the summer. Every Greek island has its own celebrations, but generally speaking, the biggest holiday is Aug. 15th -- "The Day of the Panagia," or Virgin Mary. Thousands of pilgrims trek to a holy icon in the mountain village of Agiassos in Lesvos for several days of food, wine, dancing and music. The Hellenic Festival from June through September incorporates modern and ancient theater, music, dance and opera in numerous cultural events. The Epidaurus Festival of ancient theater in July and August is another one of Greece's top attractions. To find the least expensive way to see Greece, Smarter Travel recommends braving the winter months, except for days surrounding the Christmas or New Year's holidays. You're likely to see considerably lower prices traveling in October, April, May or June. By far, the most expensive peak is during July and August.